Today, I’ve gotten a bit wiser. I have a deflective trick when I don’t like your cigar. Thankfully, this year, I didn’t have to do that so much. There were many cigars that were quite tasty, and this was for one reason: fewer companies are trying to reinvent the wheel. Fewer companies are developing concepts behind the cigar. Sometimes, lofty cigar experiments with the best intentions can go awry. Seems to me that this year, many companies are introducing good smokes without being too high-minded about it. In other words, keeping it simple. Take A.J. Fernandez for example. He introduced his version of Ramon Allones in May and showed it at the IPCPR, but he also added a belicoso to the Enclave Broadleaf line and a Gordo to the New World Puro Especial. Both of which are tasty smokes. Nothing too complicated. That’s not to say that Fernandez hasn’t been working hard. 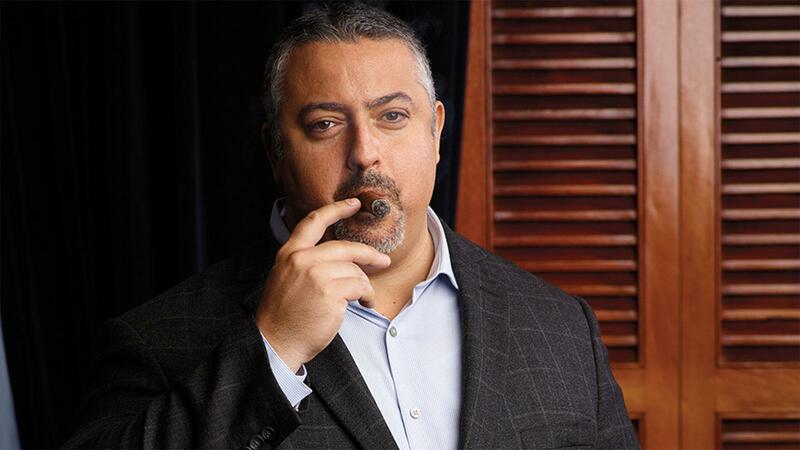 He’s been very busy making new smokes for General Cigar (like the Punch Diablo and the Hoyo La Amistad Black), and for Altadis U.S.A. such as Montecristo Nicaragua. I think it’s fair to say that he is the man responsible for bringing renewed interest to the classic Cuban brand names. Say the name “A.J. Fernandez” and suddenly, more smokers pay attention to the old iconic lines in a way they didn’t before. His formula isn’t magic. It’s actually quite simple: make cigars that are bold and tasty. The same could be said of Cornelius & Anthony. The company is owned by Stephen Bailey, whose family background is in cigarettes—think Bailey, Tahoe and Riverside—so the guy is no stranger to tobacco conventions full of retailers who demand margins. But he’s got a really nice duo of brands this year: The Gent and the Mistress. The first thing I asked when I got the samples was “which one is stronger?” The Mistress, of course. So I went for the Gent. It was my first cigar of the day. Both are made by Eric Espinosa at his La Zona Factory. Speaking of Espinosa, he released an anniversary cigar that honors his 20 years in the business. It’s a 6 by 46 with a pigtail, very similar to the old 601 Rabito size he used to make a long time ago. I always liked that size. If I can read my own handwriting, my notes say that it has an Ecuadoran Rosado wrapper, and the rest is Nicaraguan. I asked if there was any special amount of aging on the tobacco. No. Any new seed varietal? No. Just a blend that he thought was good enough to commemorate a 20-year milestone. For those of you wondering about Aging Room, the lines have been consolidated a bit, and the Aging Room concept has been simplified. Recall how each year, brand owner Rafael Nodal would create a finite number of cigars with farm-specific tobaccos from particular harvests. Once those precise tobaccos were gone, so was the brand, and then he’d move on to another finite release. He’s not really doing that anymore. Now, Nodal is doing something a little more manageable. A little simpler. Now, he has core lines. Take, for example the new Aging Room Core Habano. It’s based on the M356 blend and doesn’t depend on such crop-specific tobaccos like it used to. But according to Nodal, it still uses the same types of tobaccos and is still made in the same Tabacalera La Palma factory. Same with the new Aging Room Quattro Original. It’s based on the same F55 blend that was named Cigar Aficionado’s No. 2 Cigar of 2013 in the Concerto size. Would the average smoker now be able to tell the difference? I doubt it. I don’t think Nodal would be irresponsible with his brands. It took him a long time to get noticed in the premium cigar industry, and he really broke through with his Aging Room lines. I’m sure he has done everything possible to preserve the character and quality of the cigars. Of course, once you tell people that something has changed, they automatically think they can taste a difference. You don’t even need to change a tobacco. All you have to do is change the packaging and hordes of online cigar fanatics will rush to their favorite social media outlet making angry posts about how the cigar has changed when it hasn’t. Psychology is a funny thing. Take Plasencia Cigars for example. They didn’t introduce anything new to the show at all. The Plasencias are just concentrating on their two lines Alma Fuerte and the newer Cosecha 146, which came out last year. When I went to the booth to see Nestor Andrés Plasencia, he was gone. I was told that he was anxious to get back to his tobacco farms. Are the Plasencias messing with us? Is this some sort of head game? Zig when the rest of the industry zags? Maybe they know something we all don’t. Or maybe they’re wise enough to appreciate the value of simplicity.